Mozilla Firefox recently reached one billion downloads. To celebrate and promote it, Mozilla community has built a website called One Billion + You. This site is also available in Telugu. You can see the site in Telugu if you have set Telugu as preferred language in your browser. Or, you can select Telugu from Other Languages drop down at the bottom of the page in that website. 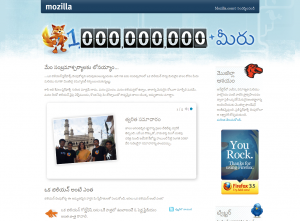 If you didn’t already know, the Mozilla.com’s home page is also available in Telugu.